Sunday afternoons we are out most weeks, usually in the Church, or if it is being used for a service we take our Tea Bar out on the street instead. For Soup Runs you may come along to observe for up to three nights, but you must complete an application form after the first night and attend a training session before continuing on team. If you would like to come along to help FAITH we believe that you will find it rewarding. Due to the nature of the work we do restrict this to over 18’s only. The exception to this would be over 16’s accompanied and supervised by a responsible adult, e.g. parent or youth worker. Although it would be very wrong to give the impression that all homeless people are prone to being aggressive, it is true that a fair number of guests who attend the soup runs will have criminal records and may well be under the influence of drugs or drink when with us. That is not a good environment to encourage young people into and needs to be taken into consideration. 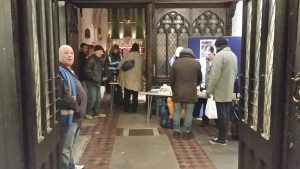 Sharing Jesus with people is of course one of our key aims, but it is by no means a precondition to feeding people! We trust that people will see something of God’s love through our efforts to help them. 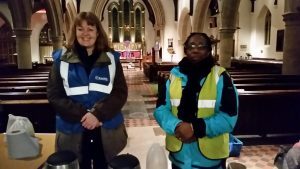 The intention is to demonstrate God’s love – in effect “be Jesus” to those we meet, as Jesus himself said, “if you give a cup of cold water to someone in need, in my name, you give it to me”. If you are not a Christian yourself you are still welcome to join with us in what we do, if your heart is to give. One would expect therefore that our street teams would be made up of “church-goers“. 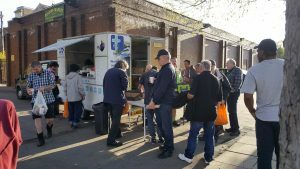 The reality is that a number of people, drawn by compassion for the homeless and of no definite faith come out as part of our teams. If you are a Christian, the one thing we would strongly advise is that you get people to pray for you regularly.